The summer rolls in with a heat wave that very few expectations, and when you find yourself craving the ultimate chill and relax you don’t want it to require extra work to get. An ice machine could be just the treat you desire, especially if dairy just isn’t going to sit well. A slushy, an Ice cone, a chilled beverage of any kind would easily turn your meal into an excellent treat, or maybe you want to create that awesome party atmosphere and still need the ice to do it. Not everyone’s fridge had the maker built right in, but that doesn’t mean you have room for ice trays or the needed time to fill and wait to freeze. Sometimes you just want to have ice on the ready. That wonderfully cold cube can do more than cool a drink as well- when the day is hot even having an ice pack just to chill on your head or neck can make everything feel better. This is where we at The Gear Hunt swing right into aide with your need to find the right equipment at the right price. Maybe you need something small, or maybe you need something a little bigger, either way, we hope to help you find the best available without the hassle of more heat and more crowds to do it. Searching the internet on your own for the right machine can get confusing, you want to know if the product can do what you need it to do before you buy it, and you want to know it won’t break on you with that very first use. No one wants to waste both time and money trying to find the right product! So sit back, put your feet up, prepare the cooler and glasses, as we bring you the top ten best ice makers for your selection to beat the heat with! If you are looking for a nice easy way to have ice at your dinner party or just to have it to chew on this may be the one for you. We found a lot of these machines have a tendency to make noise during the creation process. This one, however, seems to keep more to itself and is much less likely to disturb you with constant beeping or blower noise. You wouldn’t think this one would be a big deal, however, the longer cord allows you to place this where you prefer as opposed to where the outlet is. Nothing messes up your Feng Shuai as much as having your counters cluttered. This portable machine seems to be just about right for the average consumer. We found the cost to be slightly lower for a machine this size. That said it takes up a bit more counter space than some of our other options, but that isn’t necessarily a bad thing if you are looking for a slightly larger output. Overall, we found this to be a great choice at a decent price. Most people appreciate a more personal touch when buying an appliance. It is no longer just about performance but about the look as well. We think this might just be what you are looking for. Not all machines are created equal. This little beauty had the added bonus of being able to pick between 3 difference sizes of the ice cube. The larger size is great for tall glasses or pitchers and the smaller is perfect for the ice chewers among us. We were thrilled to see how quickly this one arrived once it was ordered. Sometimes even when we order something that is considered “local” it ends up taking much longer than we would prefer. It was nice to get something within a few days as opposed to the couple of weeks we are accustomed to. Lightweight, easy to move, and color options make this one of the more varied choices in this category. The ice production is about average if your emptying the ice bin regularly and for the ice lover there is always the option to use bottled water instead of tap. Falling at number two on our list this machine seems to be a decent price for something that can be of great use to you. Gone are the days when you must rely on old-fashioned ice trays or having your fridge hooked up to a water line to create ice for you. Della has made a fresh new friend for you to have at your get together that will keep your drinks as chill as your company is warm. In this case, it is a good thing. This particular model holds up to a half gallon of water at once. This means you won’t have to wear yourself out constantly refilling to keep the ice flowing. Ever heard the term “Like watching ice freeze”? We haven’t either and luckily you won’t have to start now. One of the nice things about this machine is how fast it begins producing ice. It can create the first batch of the day in as little as 6 minutes once it is turned on. Ice in your coffee anyone? Della seems to have made a real achievement with this machine. Overall it performs nicely as well as having different styles and colors to choose from. The footprint of the machine isn’t huge meaning you won’t have to struggle to find a spot for it. Considering the options, performance, and low ended cost we think this is a good choice. This is a name synonymous with the cold for quite some time. We are sure if you have ever owned one of those small portable boxes that assist in keeping your drinks cold at the beach or on a picnic you’ve heard the name Igloo. 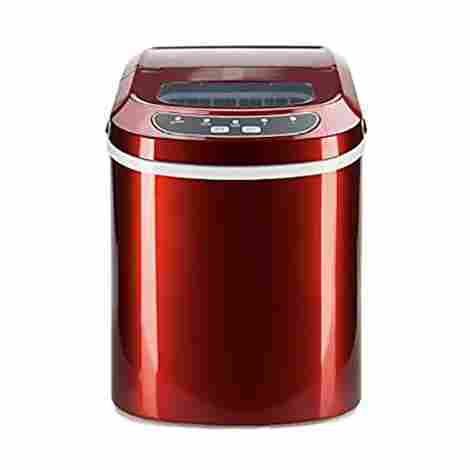 Although any electrical appliance is going to use some power not all are created equal. This Igloo Icemaker is nice as it had a lower power consumption than some other brands. This means you can get the ice you need without a jump in your power bill. This unit has one of the smallest footprints and weighs under twenty pounds, making it an easy item to take with you in a camper or mobile home. You could even take it with you for a hotel stay and avoid using those communal ice machines at the end of the floor that everyone has had their hands in. The ability to keep your electrical bill from shooting up is a nice feature for any appliance. While some of the products on this list are more obviously made to be used in a house this one seems much more travel-friendly. You won’t have to break your back to move this one around which is nice, plus it isn’t so big that you won’t be able to find somewhere for it. Taking in the cost, options, and ice production Igloo has a nice machine here. You definitely get bang for your buck. At number five on our list, we have the Think Gizmo TG22. We think there are some nice little features you should appreciate about this chill appliance. If nothing else it should help you make a decision without leaving you out in the cold. Sometimes this type of machine has a bit of a glitch-prone sensor when it comes to letting you know the ice bin is full. That was not the case with the Think Gizmo TG22. Overall there were few issues with the sensor system, meaning there is less chance of you having to constantly go check to see if it is ready. Everyone appreciates a guarantee and we are no exception. This gadget comes with a one year guarantee that is hard to beat. They will replace, repair, or refund the machine for one year from the date of delivery. That is definitely one way to show they have faith in their own product. While this type of implement can come with any number of small issues we feel the Think Gizmo TG22 more than makes up for it. There is the stainless-steel look that would complement any modern kitchen, office or layout and the slightly heavier weight means you don’t have to worry about sliding around if you're using this on the road. That together with the warranty makes us think this would be a great purchase and leave others cold as ice. Have you ever gone out to a particular place to get a drink you have at home strictly because you love to chew the ice they have? We those of us here that fit into that niche found this gadget to provide us with everything our little hearts desired without the drive. Now before you say anything there is nothing that can be done about the clunk that happens when the freshly made frozen joy leaves the mold and hits the ice bucket. However, the Opal Nugget ice maker manages to create, and inform you of every other function without any annoying beeps or whirring fans. Let’s hear it for not having a fan that sounds like a motor…WOO! Any implement you have in your home to make your life easier is wonderful. Unlike some, this gadget manages to also be easy to take care of. It is not as complex as some others and allows you to remove internal parts easily to be cleaned. Customer service will even help you walk through ideas to help clean if you not mechanically inclined. Quiet inner workings that allow you to think, a great look, and ice that will make anyone who is an ice chewer fall to the floor in spasms make this a great investment. It is more costly overall than most of the others on our list but for those that feel you get what you pay for this is a great buy. After all, a little cold cash in the beginning and you will save a bucket load in buying bags of ice for that party or tailgate during the game. There are a lot of reasons you may be looking for an ice machine. 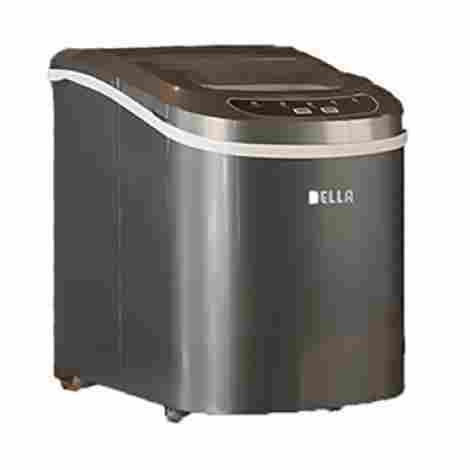 Perhaps you want a new gadget, or your ice maker broke. We have a ready solution for any potential problem with the Gourmia G1500 ice machine. Just check out the hot features on this cool little gadget. Some of us have the kind of schedule where you need to be able to plan out your day. The G1500 allows for that with a timer you can set for when the machine turns on and starts producing ice to when it turns off shutting down for the evening. If you are someone who is going to keep it running all the time we know this isn’t a big deal, but for those of you that are watching every little tick on your watch, the timer is a nice feature. ETL is a certification process that means this machine has been through a bunch of tough inspections and tested for safety, professional manufacturing, and quality. It is an internationally recognized seal of approval and basically means that the factory it is made it can be inspected at any time for any reason. Nice to know that someone is watching that what we get is made correctly. While the cost of the appliance is in the mid-range we can appreciate all the hard work that obviously goes into its manufacturing process. The three cube sizes allow you to decide which is the best for your personal use, and with the digital display and timer, there is no need to jump up worried you left this on. A nice sized footprint and light weight keep this from being a pain if you want to take your ice- ice baby with you on the road. 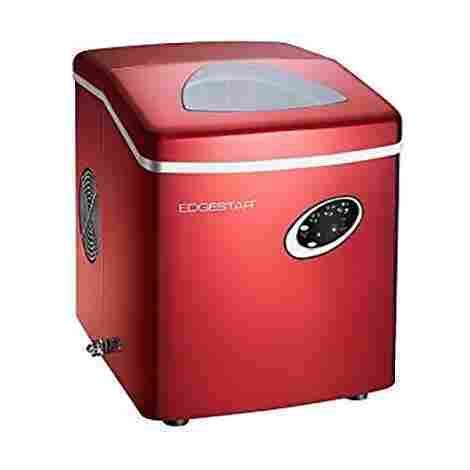 At number eight on our top ten, the Costway Counter Top Ice Maker seems like it will get the job done. It has some nice features we listed below and we can always appreciate a nice looking gizmo to use and impress with. No, we don’t mean the machine itself, we are referencing the ice inside. On the off chance, you just don’t keep up with the ice production out of love this appliance is nice enough to recycle any melted ice right back into the mold. Meaning you won’t have to worry about draining out unused ice or deal with refilling it every time it finishes a cycle. Just let it take care of what you don’t use and keep the ice flow. For this type of equipment, we usually expect a fairly high price tag. This beauty comes at a slightly lower than normal price and due to it reusing the melted ice left inside will allow you to spend less on refilling it with your water of choice. A nice little bonus if we do say so. We can always appreciate ways to save some of our hard-earned money. Every item you buy will have its good points. This machine is lightweight making it easily portable if you want to travel with it. It also has a slightly lower price point which is always a plus. If you add those features to the money you save if you had to buy ice and the satisfaction of knowing exactly what is in the water you use as opposed to tapping water this is a gizmo worth the price of admission. Our next machine makes number nine on our list of top ten. 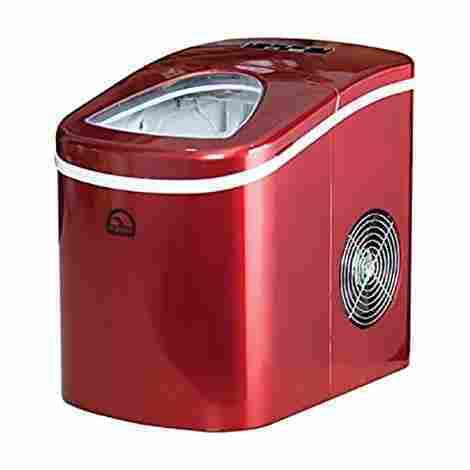 We found that the Portable Digital ice maker by Best Choice is really a nice option. Colors, and the ability to make several pounds of ice a day make it a good choice if you want or need something to help fight the heat or put a nice chill in your drink. Surprisingly few ice machines offer you this kind of option. Most come in a standard color that would fit in most households. However, since we don’t like the think of ourselves as standard we found the fact that we had some color option for this appliance a nice change. It may be that you want to match a theme or maybe you’re just daring to be a little different. Whatever your reason having a little touch of color or blending in you probably find it nice to have a touch of diversity. A lot of these machines have a sensor to stop ice production. 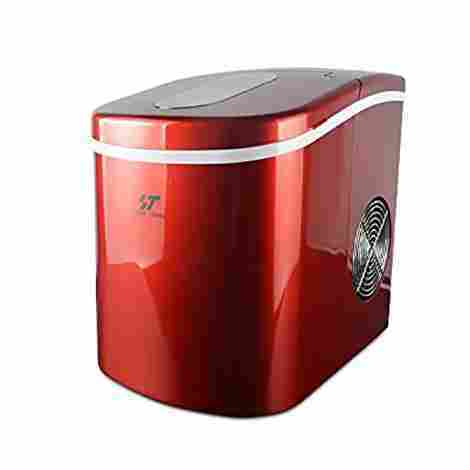 The Portable Digital Ice Maker from Best Choice goes one step further and has automatic overflow protection as well. We didn’t have to worry about water building up and leaking everywhere when the ice melted. Not a bad feature for this style of machine. While this particular machine has a nice small footprint it does not lack in ability. It offers two cube sizes and keeps going till you tell it to stop. This would not be a bad choice for a dorm room or for someone who has to travel for work. The cost is lower than some other machines out there and it still manages to give you some options in the overall looks department. We think this is a nice midway product that does what you need when you need it and won’t break the bank. Last but certainly not least the final product on our list that we loved for the name alone. It is just fun to say and since we loved the name so much we decided to check it out. It would be easy to underestimate this machine, but we suggest you give it a look and see what we think first. We found not every appliance on this list allows for this kind of feature and sometimes it does come in handy. We liked having the ability to put ice into out water bottle or soda bottle for example. It is especially nice if you are tailgating and run out of cups. It is also not always an option to keep lots of dishes around in a dorm or cookout and these were just a few ways we came up with to make this ability useful. It is always nice to be able to contact someone about anything you buy. After all, if your willing to pay for their product they should be willing to help with it. We have found that not only is the manufacturer available but happy to help with any questions or concerns you may have. Always nice to have a helping hand if needed. We found this to be a nice mid-priced product. It certainly gets the job done, making the bullet shaped ice we have come to expect from this kind of machine. 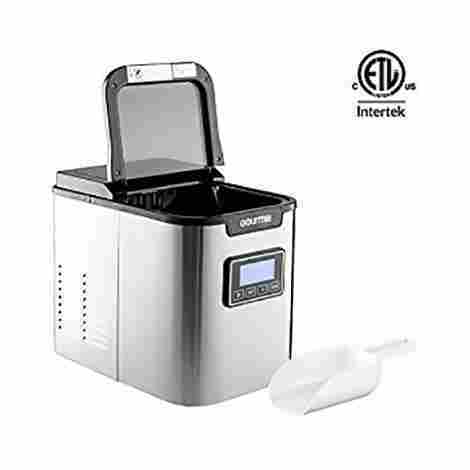 It operates quickly and quietly and you can easily remove the tray if you want to transfer the ice to a freezer for later use or a blender to make your favorite frozen beverage. Our end verdict is that this gadget is well worth the price. Just keep the water coming when needed and you will be chill all year long. We hope we have helped you in your quest for cool and that our list has given you the perfect way to get that frozen cube or slush of your dreams. Whether it’s for your home or for a party having the best item you can to make everything come together is always important. If you still have questions, however, feel free to continue down to see our criteria for choosing the icemakers, our additional facts to consider when making your choice and our FAQ section for extra questions many have had in their search. If none of this helps, feel free to peruse the sources we used in our hunt. We hope that we have given you the proper tools to select your merchandise and wish you happy buying and a cool beverage for everyone from us here at Gearhunt! An important thing to consider no matter what you are looking for, and always one of the most important on our list. Equipment that deals in making any food product must be durable, and especially those that hold liquid. You don’t want a mess on the counter, tables or floor because your icemaker suddenly quite keeping the water frozen. You also don’t want to go for a slushy only to find you’re getting water, not ice, into your drink. The product has to work and work correctly and thus its longevity plays an invaluable role in whether or not you plan to purchase it. When dealing with an icemaker you also have to consider that when you’re dealing with ice, the water is solid and does travel through the machine which offers an opportunity for cracks and breaks. These are not things you want to have happen early on its use. Thus, making durability something we must keep in mind before deciding it to be worthy of a top ten slot. Sometimes you can’t just cut corners on cost. This is evident, especially when dealing with anything electronic. That being said, there is a difference between cost and value when it comes to anything expensive you buy. Sometimes a bigger price tag does not mean better value- and this is where we focus a lot of our time when selecting our top ten. We take into consideration the longevity that can be expected of the item you’re looking at, the ability of the product, and what the average performance is. We want to see if we can bring to your consideration, in this case, where you plan to use it and what you may want to use it for. Different plans create more or less value. How big is it? How much can it make? What settings? How loud is it? How easy can it be fixed if it breaks? Are the companies easy to reach if they offer warranties? All of these things play into the overall value of a product and while the cost may not change as you consider them, it can make that price seem larger or smaller depending on what it offers. While no one size fits all, we wanted to make sure we picked the right size for each job intended. 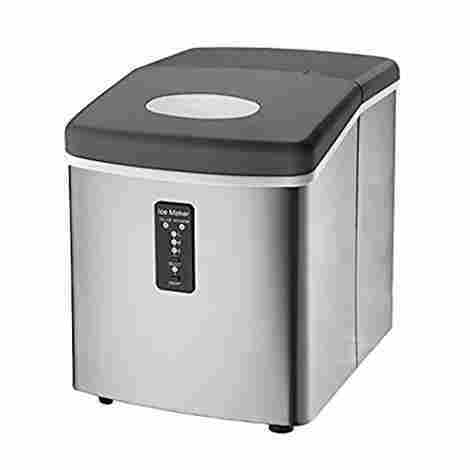 If you have a party, we don’t want to be suggesting an ice maker that only makes enough for four in the time you make need to make for ten or fifteen. So, we took each into consideration to make sure it performed the task it was intended for without having too many issues in doing so. When picking out which you want, this is an important thing to consider. If it is only intended for a certain amount of ice you may want to make sure it is adequate. Having it fit on your counter may be important at first, but if what you need it for means it needs to be larger, then you will have to balance out which you need more. Over-use of any electronic can cause it to burn out faster and some companies also consider it as misuse and not help you with replacing parts or even consider you as breaking the warranty. So always make sure you only use it as it is intended and don’t intentionally cause damage. This sounds silly at first, we know, but maybe you need chipped ice? Maybe you need medium cubes? Maybe you need a small? Not all of these machines make every size and type, but some are made to create a variety of sizes and types of cubes. When choosing our top ten we wanted to keep all in mind. After all, the desired kind of ice can be important. A little one may want a snow-cone, but if all you have is cubes, that could be an issue. 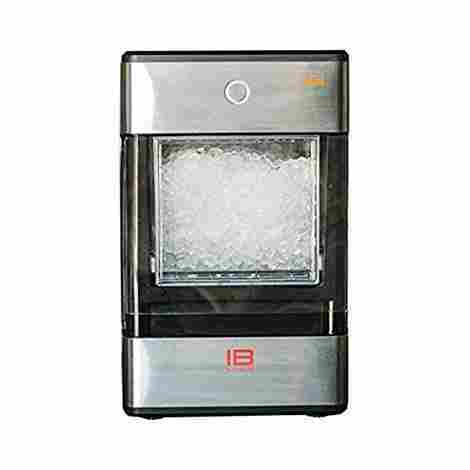 We hope that you can find the type of ice you need from one of the machines we have listed, after all, it is why we worked with a variety rather than sticking to a single style of ice- so we can hopefully help everyone with our search and information to find what they want for the right price and value. Some of us do not mind having noise when we get an ice machine- after all, it is producing ice, one expects it to get noisy- but this isn’t always the case. Since we know that some are looking for home cube makers and may not want all the noise that they make, we also checked to try and find a few that could keep quite while still producing. The number one on our list does just this! So, if noise is a factor in your purchase, check it with what you need it to do, and where you need it to fit and maybe you will have yourself the perfect machine! Age/ability matters when it comes to ice. Ice can be sharp, and it can be a choking/drowning hazard. When deciding to make ice, keep in mind if the one you are giving it to can handle ice. The cold can be something that is hard on sensitive mouths, and it can cut gums up. It can also go from a choking hazard to a drowning with little ones. While it may sound a great solution for teethers, it may be better to give them a popsicle or a snow cone style of ice over an ice cube. While the cube can melt, if the child is choking they are going to naturally be trying to breath- and melting cubes can block the ability to cough the water out. While rare and not likely to happen in most scenario’s this is still something to keep in mind. Another issue is bacteria. 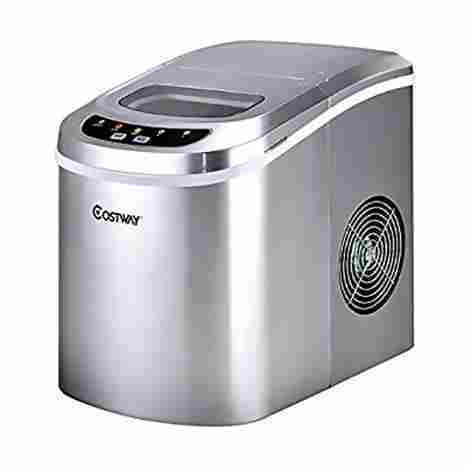 Like coffee makers and any other food-producing item or water-oriented item, ice makers should be kept clean and cared for when not in use. Ice can carry a lot of germs and even cause illness if the area it is in isn’t kept clean. Always clean your hands before and after cleaning an ice machine, and clean it often to avoid causing illnesses to spread easily, and for further common sense- always make sure you turn off and unplug the machine before cleaning it. Be sure to also keep it out of reach of small children and unplugged when not in use and out of sight. Q: Do they require a water line? A: Portable machines or home machines, do not require an attachment to a water source. Instead, you just put the water in as you intend to make Ice. Q: How long do the home versions take to make ice? A: Not long. Unlike traditional freezer trays, they only tend to take a few minutes before producing. Of course, they require refilling just as quickly because of this. Q: Do they store the amount they can make in a day, or do you have to keep emptying it to get that? A: Storage and production amounts are different. Once a machine has all it can store it will not produce more until it has room. So, if you have the max capacity filled, you will have to use more for it to make more. Q: Where can I use it? A: That depends. Some portables can be used outside or inside, while the larger ones are only useable indoors. Always plan out what you want to do before selecting the icemaker that is right for you.